Split system air conditioning units are a popular choice for Sydney homeowners, they come in 3 different styles depending on your property type, your requirements and choice of brand. Choose from any of the leading brands such as Daikin, Fujitsu, Samsung, Mitsubishi, Actron Air and more. We are pleased to work with whatever you feel best suits your budget and your home or business. Our staff are ready, willing and able to assist you in making your decision on what air con suits your property. Multi-head Split Systems - These are a great option when space outside is limited. If you are only able to fit one compressor outside then the multi head split system allows you to connect multiple units to one compressor. Any configuration of wall units and cassette units may be connected to the compressor. The power power of the indoor units will govern the size of compressor required to run the air conditioning in your home. We will happily advise on the best options for your home based on our experience of installing multi head air conditioning in countless properties all over Sydney. 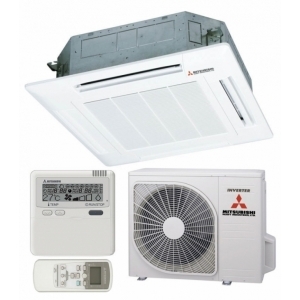 ​​Cassette split system air conditioning is a convenient option for cooling small spaces or where there just isn't much room to fit other residential air conditioning systems. Several brands offer this form of system, features such as air flow options vary from brand to brand. The great benefit of these units is that they are recessed into the ceiling so they don't occupy valuable space on the walls or floor. 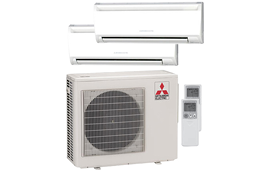 Split system air conditioners are an ideal choice for Sydney properties when space is too limited to allow for a full ducted air conditioning installation.They are commonly found in town homes, small homes apartments and offices. I. The main head unit is placed on a wall and connected to the compressor outside. A split system air conditioner is a good choice for those wanting the comfort of an air con unit in a room or certain area of the house. They are ideal for town houses, apartments, small houses, or offices. Our quality systems are both compact and powerful, while still being quiet and energy efficient. The name ‘split’ derives from the fact that this type of system consists of both an indoor and an outdoor unit. Get in contact with us today for your free Quote!